Sew Ready for Fall with Stylish Fabrics – Everything Your Mama Made & More! Autumn is right around the corner, which was evident this past week at my house as we had several days that were cool enough to turn off the A/C and let some nice, fresh air into the house! Mother Nature must’ve been looking at my sewing plans. With the leafy fall top I made last week and this week being my turn in the Sew Ready for Fall blog tour put together by Tibeca and sponsored by Stylish Fabrics, that cool front came just at the right time. Psssst, there’s also a great giveaway going on … read to the bottom for the link to go enter! 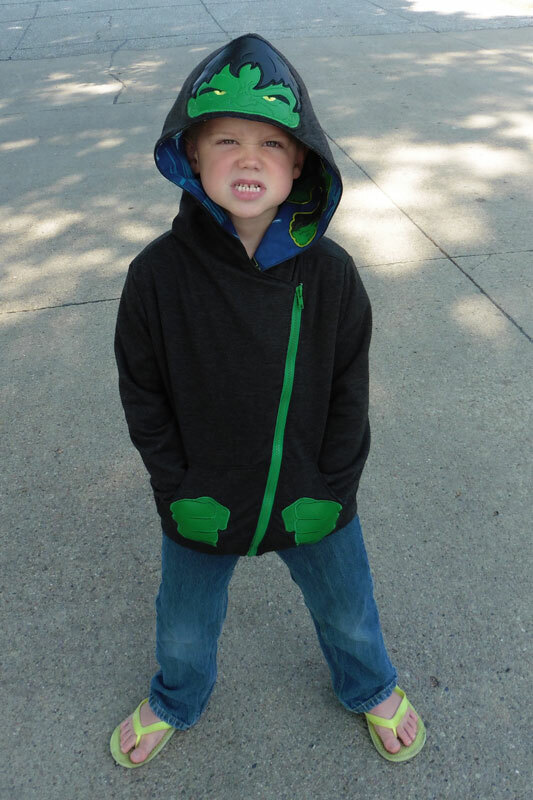 My middle son has been asking for a new Zander’s Hoodie since last spring, but I couldn’t bring myself to make it during the heat of the summer. So this tour was the perfect opportunity, with a deadline to get it done before school starts next week! Knowing that a hoodie was the plan, I combed through the many fabrics Stylish Fabrics has and requested this lovely Black Two Tone French Terry. I knew the French terry would be lighter weight than a normal sweatshirt material, but thought it would be great for transitioning when mornings are cool but a heavy jacket isn’t necessary yet. What I didn’t know was how luxurious this French terry would feel. I kind of thought the price point of only $7.40 per yard meant that it might not be the best quality, but it is super soft and the stretch and recovery (4% spandex) is better than many French terry fabrics that I’ve come across. What a bargain … I think I’ll be ordering some more to sew for ME! 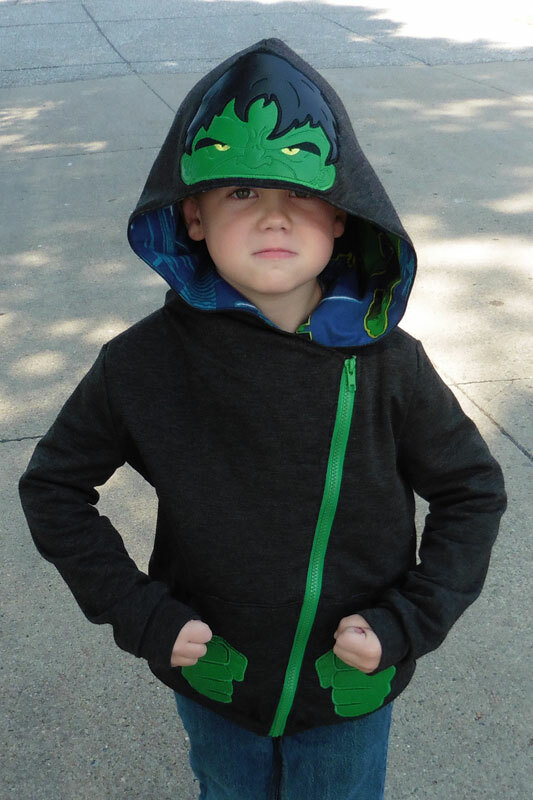 After picking some neutral-colored fabric, I consulted with my son about how he wanted to embellish his hoodie … because I knew that he’d have his opinions. 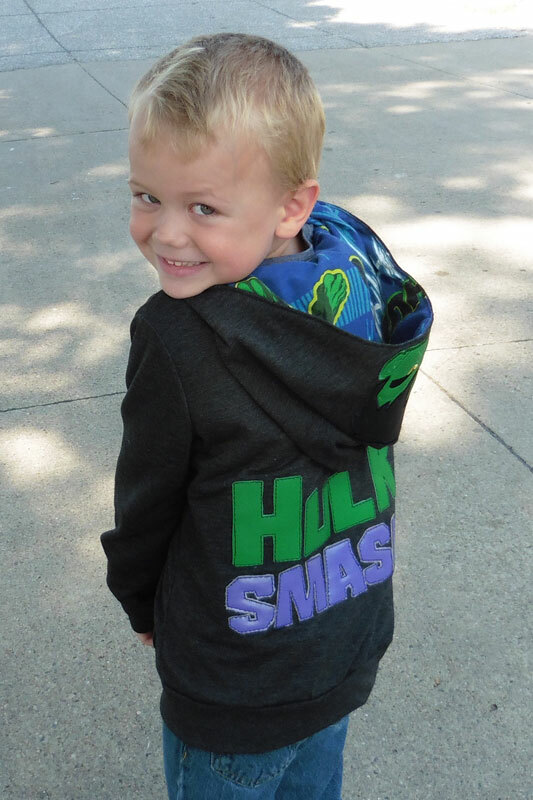 Without hesitation, he told me he wanted a Hulk hoodie “with all Hulk fabric on the inside and the words ‘Hulk Smash’ in green and purple on the back.” Well … okay, then! I drew up a plan and, with his approval, got to work setting it into motion. 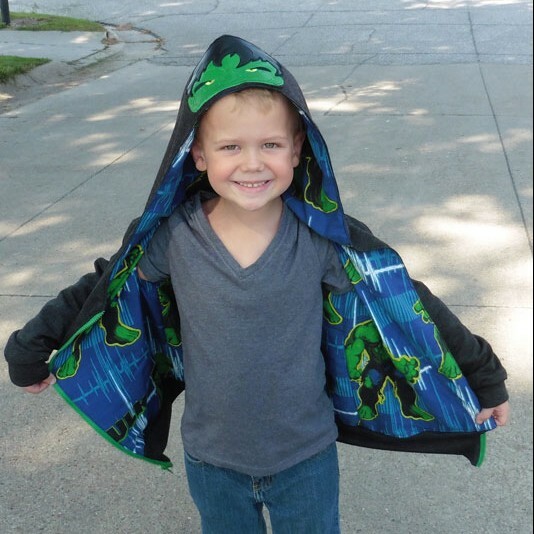 Besides the black two tone French terry, my plan included machine embroidery using marine vinyl to applique, a green zipper, and print fabric for lining the hoodie. My next task was to locate this “all Hulk fabric” without breaking the bank. My son was adamant that the fabric not have any other characters! After searching, I found that “all Hulk” fabrics are limited and pricey. I settled on ordering a set of Incredible Hulk curtains off Ebay. 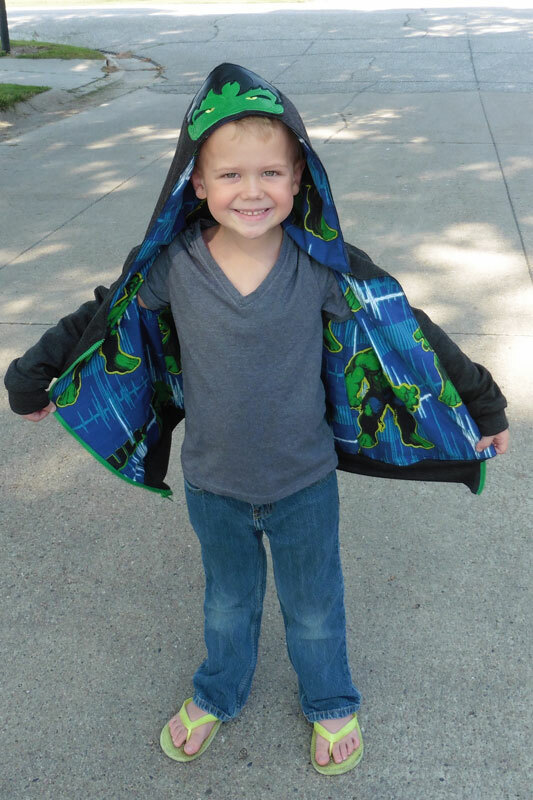 Woven fabric is not a recommended fabric in the Zander pattern, but I knew it would work as lining because I used woven cotton before to line this boy’s old hoodie and his big brother’s hoodie. Upcycling curtains rocks because the price was right and, lucky for me, there was enough “yardage” to fussy cut so that there’s a Hulk on every lining piece, which makes for a happy boy! To jazz up the front, I added a few machine embroidery applique designs using marine vinyl. 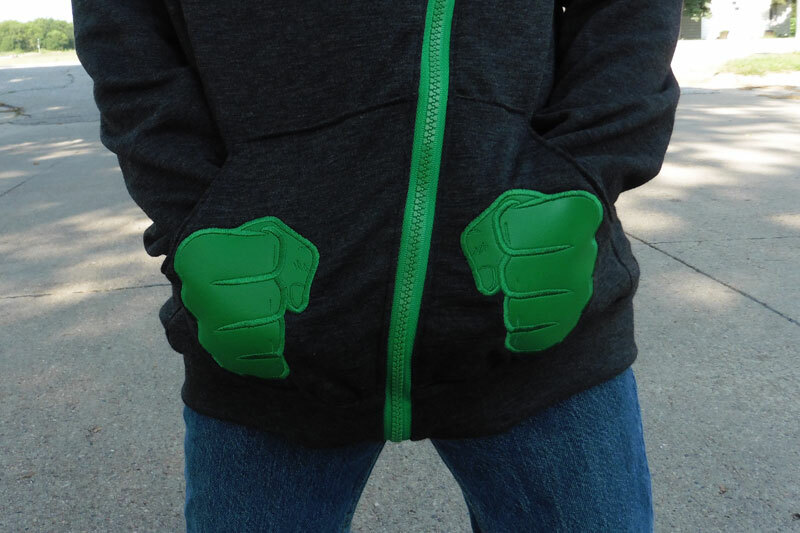 Hulk’s fists were the perfect addition for the hoodie’s pockets. My son couldn’t keep his hands out of the pockets and I could see his own fists balled up inside … hence the seemingly wonky top edge of the pockets. The pockets really are sewn straight and aligned with each other, I swear! Haha! 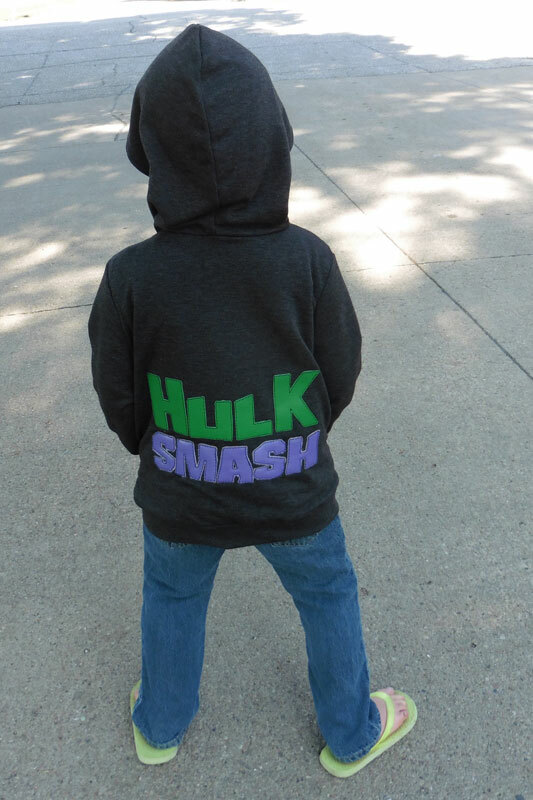 To finish off my son’s vision, I printed out the Hulk Smash logo to use as a template for the wording. Rather than cut each letter and try to align them while sewing them on individually, I cheated a little. I first laid a strip of green and strip of purple vinyl on the hoodie’s back (before starting construction, so I’d have less fabric to move around). I topped it with the paper print-out, pinned all the layers, and sewed right through the paper around the edge of all the letters. By the way, I did use a medium-weight interfacing on the inside of the French terry to give me more stability while stitching the letters, then I trimmed most of it away when I was finished so the back wouldn’t be unnaturally stiff. After outlining all the letters with stitching, I just had to tear the paper off the top and trim the vinyl close to my stitching! Perfectly aligned and easy peasy! 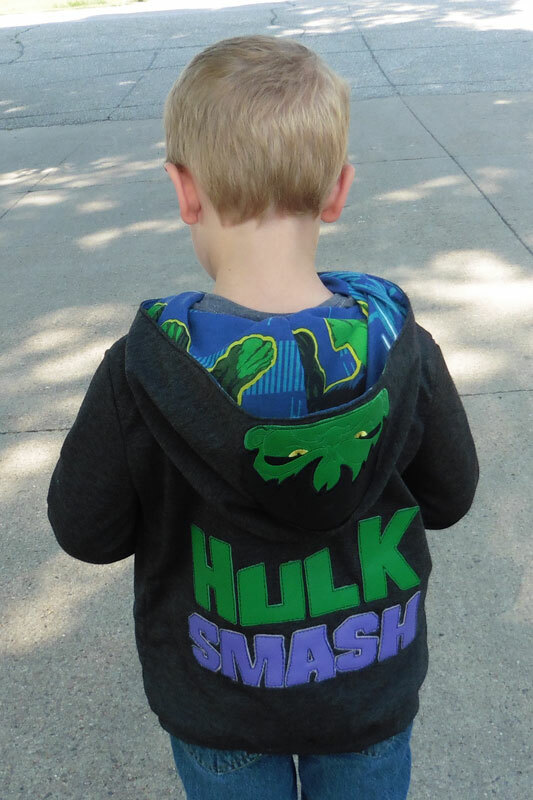 This boy is pretty much guaranteed to be the only one in pre-k with such an awesome Hulk hoodie! 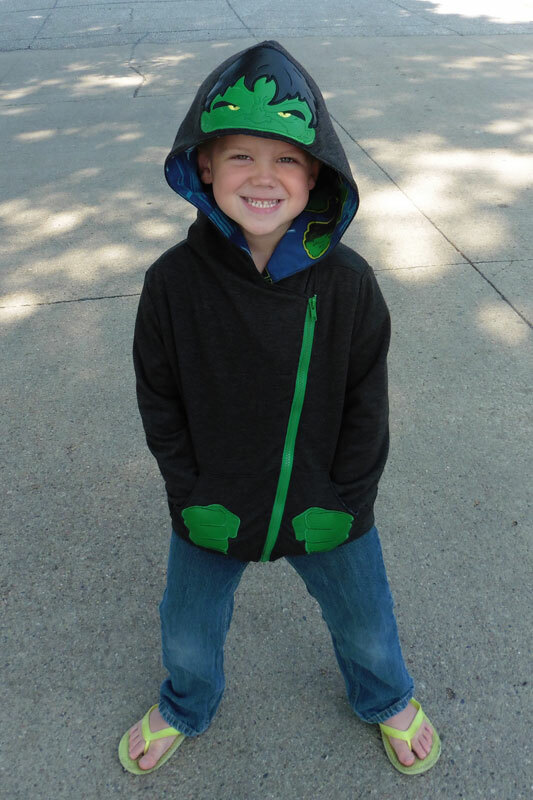 I’m so glad the Stylish Fabrics Sew Ready for Fall tour gave me the push to get his new hoodie done before school starts! 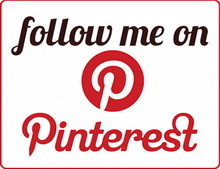 There’s a huge giveaway going on over at the Sew Stylish Community blog. 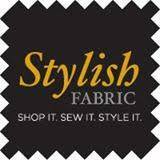 Prizes include a sewing machine, sewing box, $50 gift card to the EYMM shop, and many other patterns from different designers. Also, don’t forget to visit all the other stops on the Sew Ready for Fall Tour! Now go enter the giveaway for your chance to win! I love it! What a perfect jacket for your little!! Great job! This is one of those times in my life where I’m at a loss for words. Amazing is not enough to describe this hoodie. And your son would probably be offended at the word adorable. It is just over the top, absolutely perfect and my kids have now commissioned me to make one for them. I hate to disappoint them, but I’m not so sure I’m up to the task. Aww, thanks! I’m sure you could do it! I cannot get over how perfect this is! My son is definitely going to need something similar- and thanks for the tip on the woven lining. I’ve made a few Zanders, and that’s super helpful to know for my next one! Thank you! This is my 7th Zander (plus a me-sized one from the adult pattern) and my 3rd using woven. I almost prefer the woven since sometimes the 2 knits stretch differently and are harder to sew. Haha! This hoodie is so, so awesome! I love being able to make my kids’ clothing dreams come true. I especially love the Hulk hands on the front pockets. I used the french terry with spandex for my project as well and it is lovely fabric. I agree with your assessment, I need more of this french terry to sew for myself! What a great shortcut for the letters. And I love the Hulk fists! Thanks! I almost always do my lettering knit appliques like this (tho I don’t think I’d try it with wovens unless wanting that frayed edges look or planning to go back around with a zigzag after trimming). I use the triple stretch stitch so that it’s strong enough to stay with just one time around the letters. This is fabulous! Your son is so lucky that he has such a creative mom who could execute his vision perfectly. All of the other boys will want one, too. Aww, thanks for the sweet words. I hope my kids always enjoy me sewing for them!